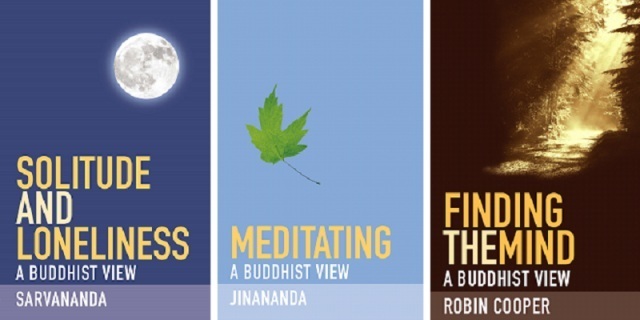 Our 2012 A Buddhist View series examines key issues from a Buddhist perspective and offers practical guidance for living in the 21st century. In Solitude and Loneliness, Sarvananda explores the themes of isolation and loneliness and how a Buddhist might deal with these problematic emotions. He looks at in what way time spent in solitude can be of benefit on the Buddhist path, and investigates the seeming paradox that, in facing up to our essential aloneness, we come to recognize how essentially connected to others we truly are. Meditating is the new revised edition of Jinananda’s popular introduction to Buddhist meditation. It explains how meditation is about being true to your experience, which means getting behind the idea of what is going on, behind the label, to the ungraspable experience of this moment. Jinananda shows you how to start doing this, how to sit comfortably for meditation, and how to do two meditation practices that develop clarity, peace of mind and positive emotions. In Finding the Mind, Robin Cooper explores the Buddhist teaching that our own mind is the key to understanding and transforming our experience. Buddhism takes an exploratory approach; it is not a revelation of religious truths, and Robin Cooper teaches us how we can become more aware, probe the edges of our awareness, investigate, and find our mind. Solitude and Loneliness and Meditating are available to purchase from the Windhorse Publications website. Finding the Mind will be published in September.